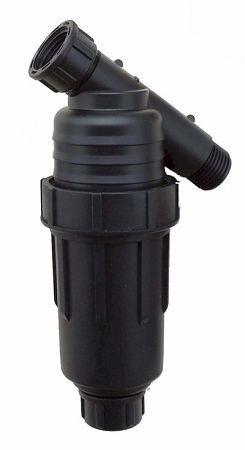 Drip Irrigation Filter "Y" style has more surface area that the T-filer and requires less cleaning. It has Female Hose swivel on the inlet for attaching to a faucet or end of a hose, with a male hose thread on the outlet to connect to your drip system, timer etc. The body unscrews to clean the 200 mesh stainless steel filter. By removing the hose cap you can flush out your system periodically. Hand tighten to make a water tight seal.